Spain to Australia. In the United States, there will be two major cicada "shows" in 2015. One is Brood IV--17-year cicadas emerging in parts of Iowa, Kansas, Missouri, Nebraska, Oklahoma, and Texas. The other is Brood XXII--13-year cicadas emerging in parts of Arkansas, Illinois, Indiana, Kentucky, Louisiana, Mississippi, Missouri, and Tennessee. Every summer during my childhood in western New York, dog-day cicadas buzzed from high in trees. And every summer, my brother and I searched tree trunks for their dry, hollow nymph bodies. We competed: who could find the most of these strange-looking "husks?" Much later, in 1979, I met another kind of cicada: Brood II of periodical cicadas--one of the amazing populations of insects that have a 17-year life span. In parts of Nyack, New York, a few miles from my home, I found these red-eyed insects everywhere--crawling over the ground and sidewalks, climbing trees and fence posts. Thousands of male cicadas filled June days with their loud buzzing. I took some photos, but the great spectacle was soon over. Sadly, I added the number 17 to 1979 and vowed to be ready for the next generation, in 1996. That year I visited Nyack many times. I wanted to get a new colony started near my home, and followed the advice of an entomologist. She suggested that I collect twigs where female cicadas had laid their eggs. With hand clippers I pruned a few trees of these twigs, then scattered them in a protected forest near my home. In June 2013, I learned that my efforts to start another colony had failed. I also learned that others before me had also failed to start new colonies of cicadas (in Washington, D.C. and elsewhere). So now my focus is to protect the forest habitat of existing colonies of Brood II, so the next generations will emerge in 2030, 2047, and beyond. 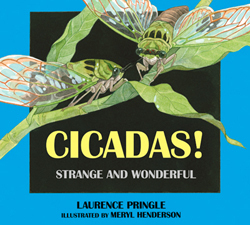 NOTE: The book explains in detail that cicadas are NOT locusts. Many people make that mistake. Locusts are grasshoppers, and can be very destructive to food crops. Cicadas are part of a very different group of insects, and are harmless. Remember, CICADAS ARE NOT LOCUSTS!